Our best general purpose bird feeder. Easy to use top-loading hopper protects seed from the elements. Innovative clean out perch provides simple waste removal. Deep narrow lathe turned feeder bowl helps prevent birds from kicking out seed. New innovative wind guard keeps the lid in place. Glass tube reveals seed level. A pine cone is added to make our Songbird Lantern bird feeders a dual purpose seed and suet feeder. 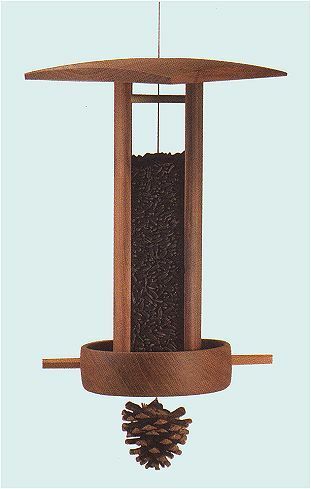 These bird feeders attract Cardinals, Evening Grosbeaks, Finches, Chickadees, and other seed eating birds.Holds approximately 5 cups of seed.